This one won a maze design award (who even knew that such things existed?) It's shaped like Northern Ireland. Can't you tell? Supposedly the biggest maze in Christendom, with a great big pineapple at its centre. What's not to love? This one's nice because it has sunflowers. 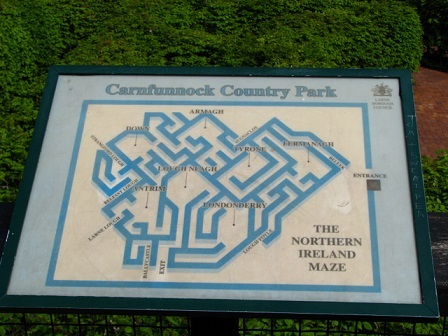 Only at certain times of year, mind - it's a much better maze in the summertime than in winter. It's like David and Goliath, except in the air. This forum post tells the rather amusing (but also slightly sad) story of a UFO sighting organisation in the Netherlands who recorded several false sightings because someone was out flying their quadrocopter after hours. Lesson learned, we suppose? We're not quite sure of the law here in Britain, but in Georgia, USA, you're not allowed tobacco in prison. It's contraband. Still, that didn't stop some bright sparks from flying an RC helicopter over the prison wall in an attempt to give the prisoners on the other side their nicotine fix. Incidentally, the four people responsible were apprehended, and they may face up to 20 years in prison for smuggling contraband goods. Somewhere, the Gods of Irony are chuckling to themselves. So there you have it - proof positive that Britain really is better than America. Well done, chaps. Let's all celebrate with a spot of Marmite. Oh, and in case you're wondering...no, we're not biased. Hi everyone. We'd like to say Happy New Year, but frankly, we're not feeling all that happy here at Gadget Inspector right now. Christmas is over for another year, the decorations have been taken down, and it seems like we've had all the presents we're going to get. Yes sir, the post-Christmas blues have well and truly settled in. Some people will tell you that it's time to move on, to face the new year with a smile and make the most of every opportunity January throws your way. We don't buy it, to be honest. If you ask us, the best cure for PCSS (Post-Christmas Stress Syndrome) is denial. Put on your Christmas onesie, grab your Love Actually DVD, and pretend it's still December and Santa is still in the process of double-checking his list. Does that sound pathetic? A little bit, but can you blame us? The Christmas comedown is difficult to deal with, and the fact that it comes in January - a long, wet, mouldy loofah of a month - makes it even more depressing. Of course, even if you don't miss Christmas that much (heck, some people are probably glad to see the back of the busy festive period), our Christmas onesies are still every bit as cosy and stylish as they were two weeks ago. 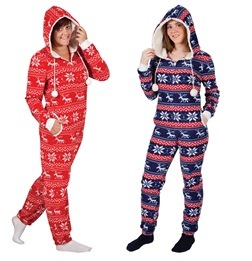 Onesies are wonderful no matter what time of year it is - click here for our full collection.